Before I became a self-published author, I had no clue what going indie would involve. What I’ve learned is this: if writing books is one side of the coin of being an author, marketing is the other side. And to be honest, the amount of time it takes to share your books with the world takes about as much (if not more) time as it does to write these books. Since I currently have marketing on my mind, I thought I’d share some tips I’ve learned over the years for what works and what doesn’t work when trying to sell books. For starters, imagine you’re floating along in a big, vast ocean, and everywhere you look there are other people floating along, too. This is what being an author is like. You’re just one itty, bitty voice in a sea of voices. About 800,000 voices to be exact, according to the Google search I just did for “how many books are on Amazon”. So, yup, you need to market your books if you want anyone besides your mom to read them. 😉 Even toilet paper companies advertise their products and everyone I know uses TP several times a day, every day. Imagine how much harder you need to work to sell something that not everyone needs on a daily basis. Hehehe! 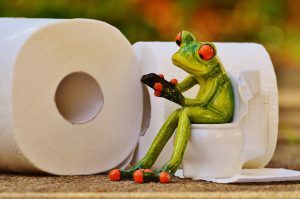 Even frogs use TP?! Paid ads. Specifically on websites that have thousands of subscribers who—you guessed it—love to read. 🙂 These ads can range from $5 to $500, depending on the site, but they are worth it. The bottom line is this: You need to spend some money to make money. Free ads. Of course there are ways to advertise your books for free. There are tons of Facebook groups for people who love to read and you can usually write a post about your book once a day. I heard that a person needs to see an ad 5x before they’ll consider buying the product, so this is a good way to get some long-term exposure for free (vs. a paid ad that is only for one day). Sale books. Putting your books on sale for a few days is a great way to reach readers because who doesn’t love a good sale? Amazon’s Kindle Unlimited program allows you to do a “countdown deal” where you can temporarily lower your book’s price. You’ll have to advertise the sale on your own (see points 1 & 2 above), but you’re bound to sell more books at a sale price than at regular price. And any sale is better than no sale. Free books. It seems counterintuitive to give your book away for free in order to sell books, but strangely enough, it works. The point once again is to get your name and book(s) out there. To be that one person in the sea that gets a spotlight shone on him/her for a few hours or days. Amazon also has a program where you can set your book’s price to $0.00 for a set time. Once again, you’ll need to advertise your freebie (see above). The key to giving your book away for free is that you should have other books published, too (preferably in the same series), so that readers who love your writing enough will buy your other books. That’s how you make sales by giving away a book for free. I’m currently running a free promotion on the first novella in my Taking Chances series (get it HERE for free through Oct. 23!). It’s funny, but I was super excited yesterday to find out that I’d given away 2,089 books. The downside is that I don’t make money from any of those “sales”, but I did sell 5 copies of my other books and had 630 pages read from the Kindle Unlimited program. At half a cent per page, that almost pays for a cup of boba tea. 😉 But I did get one new review for the free book and am hopeful I’ll have more pages read and some more sales over the next few days. So, what doesn’t work? Sitting on your behind and not doing anything to market your books. This is what I did for over a year and my sales (or lack thereof) reflected my stubbornness and frugality. 😛 I only started paying for ads back in May of this year, but I haven’t stopped since. This entry was posted in Makings and tagged author, K-Ci and Jo Jo, Kina Grannis, marketing, self-publishing, writer.